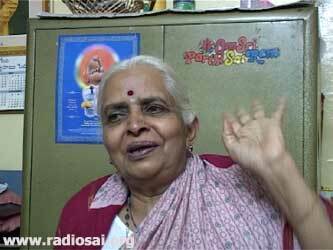 In the last issue, we had the first part of our second interview between Mrs. Padma Kasturi (commonly called as Padmamma), daughter of Sri N Kasturi, Swami’s biographer and Ms. Rajeshwari Patel (RP), an alumnus of Swami’s University and now a faculty member in the Anantapur campus of Sathya Sai University, which was aired on Radio Sai a few weeks ago. Now we have the second part – the last in the series which we hope you have enjoyed. 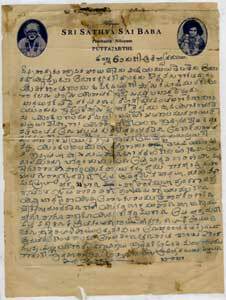 PK: I also have some mementos of letters which Swami wrote to me. RP: First tell us about that book-mark that I saw with you; a very unusual book-mark. PK: No, a green one. RP: Ah yes, it is easier to bend it then. PK: Yes. 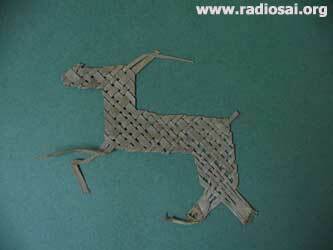 Then He would split it; take out the strands and then He used to weave it! RP: This one looks almost like a deer! PK: Yes, it was almost always a deer. He used to give it to the person nearby and he would use it as a book-mark. And I got one too. RP: Ah! That is why I wanted to know what you had with you! So that’s another memento then! RP: And it shows Swami’s Divine craftsmanship! Even though He is the Creator; you can see the delicate touch of the Creator in this book-mark too! Okay, now tell us about your letters. PK: Since I was married very young, there was some kind of a misunderstanding between me and my husband. So to solve that, sometimes Swami used to call us for an interview to make us clear about the problems. But somehow it was not getting solved so easily - we couldn’t understand each other very well. So to convince me, and advise me, and guide me as to how I should lead the life in the family, Swami used to often write letters to me. I will read some of the extracts from the letters. I will read it in the language in which Swami has written. Can you translate it? RP: Yes, after you finish the whole letter, I will translate it into English. PK: At first He used to write to me in the Kannada language because I come from Mysore and Bangalore. Then I started learning Telugu and after I was efficient in Telugu, He started writing to me in Telugu. But Swami had His own way of writing! It used to be in the English script; but the language would be something different! RP: So He would write letters to you in Kannada or Telugu but the script would be in English? RP: Oh! So that you could read it without difficulty. RP: When He wrote these letters to you, how did He address you? RP: And how would He sign off the letter? “Samsara is the saara or essence of all vishayas or worldly tendencies. Samsara is a mixture of difficulties and comforts, truth and untruth, laughter and tears. But in this, you must select the dharmic; only the righteous – other things you need not concern yourself with. Samsara is not about a single individual; it is about husband and wife. The wife mustn’t do anything without the knowledge of the husband; and the husband in turn must not do anything without the knowledge of the wife. Samsara is the coming together of the husband and the wife; each should share the joys and the sorrows of the other. If there is a problem, it must be solved between yourselves; it should not be revealed to a third person. Husband and wife are like the two eyes of the face; if there is any ailment in one eye, it affects the one face. You both should live properly in faith and bliss. Earlier, in the previous letter, He has defined samsara as a mixture of truth and untruth. So I think He was trying to say that the characteristic of life is to swim through these difficulties without drowning yourself in the ocean of worldly existence – which is samsara. PK: Then after that, the problems increased – my husband lost his job and my father-in-law had an enlargement of heart, so he had to retire – he had no job. So there were financial and psychological problems going on in the house. PK: And since I had three children; it was really a big problem and I didn’t know what to do. RP: Trouble usually comes in battalions! “Amavasya or the new moon night – dark night - is not everlasting. Poornima or the full moon night is certain to follow. Just be patient for some time. Know that Swami’s protective eyes and watchful eyes are ever on you. Swami will never put you through difficulties. Because of difficulties coming one after another in succession, your mind is agitated. This is the time to use Swami’s name for courage. Will anyone wear woolen clothes in summer and thin cotton garments in winter? Never, ever! 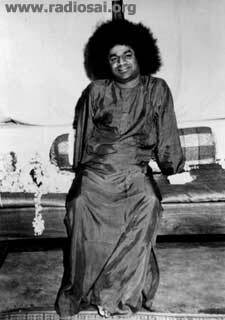 For the present heated state of your mind, wear the cooling garments of Bhagavat chintana or remembrances of God. 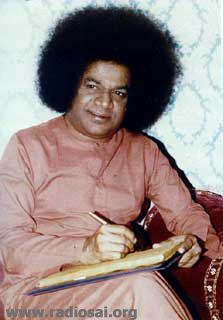 Do not increase the heat of your mind by wearing the woolen clothes of Prakriti chintana or thoughts of the world. PK: I would like to narrate an incident related to this situation where you will understand Swami’s care and His Compassion. You see, when I was going through this very difficult financial time and having three children, one day, my youngest son Rajaram who was born here, he was three years old; he had the habit of having a biscuit before he had his milk. That day, there was no biscuit and I couldn’t afford to buy it either – because the situation was so bad! He started to cry and throw a tantrum and it was very difficult to convince him. RP: Because he wanted to have his biscuit! PK: Yes, and because of the situation, even my mother-in-law was upset at me to have brought him up like that and to have gotten him into that habit. RP: For having trained him to have his biscuit with his milk! PK: Anyway, I didn’t know what to do! My only solace was Swami! I wrote a letter to Him: “Swami! Are you not hearing my child’s cry?” I just poured myself out in that letter and I mailed it to Puttaparthi. That’s what I had always done. 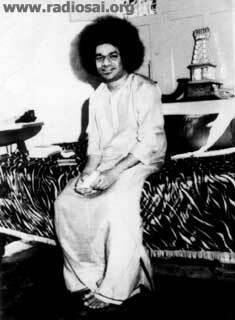 But unfortunately, Swami was not in Puttaparthi at that time. I didn’t know that He was on a tour. He wrote after 4 or 5 days. 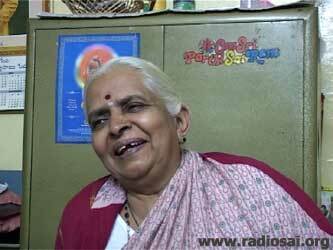 My parents were in Puttaparthi at that time but I didn’t inform them about my difficulties or anything. So they didn’t know what was happening to me. RP: You were in Bangalore. RP: But you wrote that letter to Puttaparthi! And Swami was just getting down from the car and asking your father! Which means that maybe the letter didn’t reach Him physically, but He heard your agony? PK: Yes. Immediately after getting down from the car, when He came from the tour, He asked for this. Then He asked my father to put them in the front for the interview - where they used to sit in the veranda for the interview. Swami told them: “Please give Padma’s address to them.” My father was wondering what is all this that Swami is asking - if someone is going to Bangalore and giving them his daughter’s address. RP: He didn’t know anything! Swami didn’t tell him anything? PK: No. He called those people for the interview and gave them a big cardboard box and said: “Take this address and go to that house and give it to her.” Same day, in the evening they came and they gave me the box which had dry fruits from Delhi. I couldn’t express my gratitude! RP: You were right when you said you can’t describe this Swami! That is just Swami! PK: Then after these problems were over, my husband wanted to get a job. He thought of getting a job in Bombay. He went there and it was very difficult for him to settle down in Bombay. In those days, I had come back to Puttaparthi with my 3 children. There was no proper school in Puttaparthi then. So I was planning to go back to Bangalore again and see to it that these children were educated. But at that time I was just 28 years old! I didn’t have the courage to go and live all alone with three children! But if Swami would have physically given me the permission, I wouldn’t have minded it. So I sent word with my father to Him that I had decided to go to Bangalore and live with the children all alone but I want Your permission directly. Swami didn’t give me any permission here; it was summer so He went to Bangalore and after going to Bangalore, He wrote a letter to me. RP: Swami wrote a letter to you! PK: Yes, and in that He gave me the permission and the courage to go and stay in Bangalore. RP: Yes. This is for all mothers I am sure. “Right now, instead of being pre-occupied with other things, busy yourself with the taking care of the progress of your children, dear one. Make them virtuous and proficient in sath vidya – knowledge of the Truth. Is this not the responsibility of the mother? You may be wondering about how long this is going to go on; but don’t wait for time. Do your duty then time will disappear in it. In such matters, karma or action is more important than kala or time. Even if the time is not good, if the action is pure and good, it will transform or purify time too. The good and bad time is the result of actions, isn’t it? So follow Swami’s commands and perform your duties happily and in a righteous manner. PK: So, by going through these problems, I came to understand what Swami once told me in an interview - Swami is the only real, true relative and the others are veer bandham – compulsory attachments. RP: The relation with Swami is Eternal. RP: It is before birth and it will always continue. PK: Yes. So He made me realize this and now I think it was worth going through these problems so I could come to the conclusion and the realization. There is one more letter I would like to read. RP: One minute! I just have one small doubt which I think I would like your opinion on. And I am sure there are others who have similar doubts; so maybe you are the best person who should answer this. You would think that life in general would be much more smooth and less difficult when Swami is physically close to you. You were one of the inner circles. So what do you think? Is there an inner significance in the fact that despite the Divine physical presence, many of Swami’s devotees, who were ‘in’ so to say, experienced some of the most trying situations? Many of us – I am not talking about just you – what I feel is that there is probably some significance. Is Swami putting us through these difficulties in His physical presence to teach us something? Because generally outside people would think; if you have God – you know what happened to the Pandavas - if you have God, you should have no difficulty. But many who are in the inner circle, in the Grace and the presence of Bhagavan, experience some of the most difficult situations. Could you give us an insight into this, based on your own perception of it? PK: Yes. Maybe we have to go through these problems because of our past karmas. Swami takes us so near and He gives us the strength to pass through these problems, and to later realize what is real and what is unreal. RP: Okay. And then there is one more thing I have noticed in these letters and in some of the books that I have read. Swami constantly – and I think He is still saying the same thing until now too – is that, He advises us to and through your letters too of course; all of us, His devotees, to do namasmarana. That the name is everything! Don’t you think so? Because even now, He keeps saying that the times are bad, they are difficult, but just keep taking the name of God and everything will be alright. PK: Yes, because it helps us to keep our mind calm and face the problems. RP: So there is a lot of power in the Name of God? RP: Yes, please tell us about it. PK: You see, we usually write letters and give it to Swami, but sometimes we are not able to give it to Him, and then we feel very sorry that we were not able to. RP: We feel disappointed that He didn’t take it, or we couldn’t give it to Him. PK: Yes. But it doesn’t matter, because as we write, He knows the essence of the letters. PK: Yes. I have got one proof for that! RP: Okay, please tell us. PK: Just to give you the background of this letter before I wrote. Before his retirement, Swami had asked my father to take his mother for a teertha yatra – like Kashi, Mathura, Brindavan; and Swami told him: “Buy three tickets, and four of us will travel.” Because Swami said: “I am a ticketless traveler!” They had been to Delhi and Kashi and all those places. During that time, my husband had a typhoid attack. He had high fever and I was very worried. I didn’t have anybody and since my parents were not there, I felt like I should write a letter to Swami! So I wrote a letter to Swami and mailed it to Puttaparthi. But unfortunately, I didn’t know that Swami was in Kodaikanal. RP: You didn’t know the Kodai address either! PK: I didn’t even know that He was in Kodai! I thought He was in Puttaparthi. After a week or ten days, my husband got better and my parents came back from their trip. My father had also written a letter to Swami about his pilgrimage – it seems he had Swami’s Darshan in Kashi, Mathura and Brindavan too! PK: Yes! So he wrote a letter to Swami about all that; he was so happy! RP: Like Shyama in Shirdi Sai Charitra. So he had the Darshan of Swami in all those places? PK: Yes! And in reply to that, Swami wrote a letter to my father. And in it, He has also mentioned about the letter that I wrote to Him too. In other letters, Swami used not to write dates, but in this letter He did! 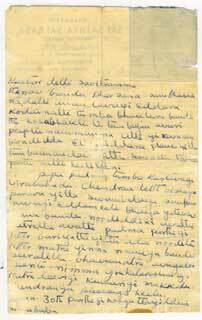 This letter was written on 26th May, 1955; it is in Kannada. 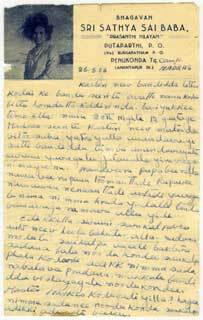 “Kasturi, the letter you wrote, reached Me in Kodai. Since I was leaving Kodai the same day, I didn’t have time to reply! I reached Madras on 25th night, 12 o’clock. 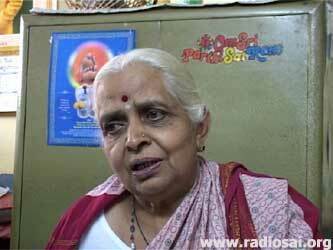 Kasturi, I am very happy that your pilgrimage with your mother passed off well. When Swami is with you, what more is needed? Name is not different from Form; the Name points to the Form. When you see the Form, you remember the Name. When that is the case, that My Name is always dancing in your heart, naturally, you could see the Form! You could say that it is all Swami’s sankalpa or Will. No! Sadhana first; then sankalpa. That is, human effort first, then the Divine Will takes shape. Divine Will is always in proportion to the power of the devotees’ sadhana. Therefore, the power of sadhana is important. The master or the teacher gives marks according to the answers written by the student. Likewise, the Divine Will manifests based on the sadhana. But for this also, anugraha or the Grace of God is required. PK: Beautiful letter! So these are all the mementos I have. RP: Did you ever think of putting all this together in the form of a book? PK: Yes, I am thinking; I have already written one book in my language – Kannada. RP: What is the title of the book? PK: I have not yet decided. RP: Are you still compiling it? PK: It won’t be much; maybe 100 to 120 pages. It will be a small book with all my experiences; and with these letters too. RP: And maybe a more exhaustive number of letters? PK: No, not any more letters; just the same. But maybe more experiences in that. RP: Alright. I think that’s it for now. Thank you very much. As I said last time, talking to you is like unraveling secrets. It was a great pleasure for me to converse with you and I am sure the listeners of Radio Sai Global Harmony will be extremely grateful to you for sharing with them all these very rare and beautiful experiences that you had with Swami. 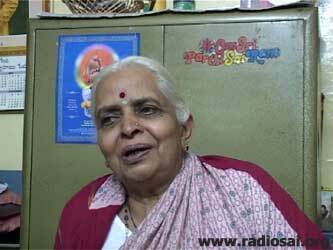 PK: Thank you Rajeshwari and Radio Sai for having given me this opportunity to share all my experiences with Bhagavan with all the listeners. And in a very extreme form of tribute to Swami, that I have been able to say it. Sairam.